3/8" thick tube construction on reach. 5/8" thick flighting on vertical beater. Remote grease banks. 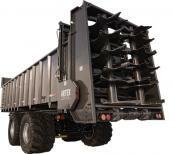 12.5 Ton Capacity per Axle. High standard big barrell WR78 floor chain. Swivel hitch or single lip hitch. 7 tooth rear chain drive sprocket. Undercarriage equipped with self-steer technology. 12 gauge steel Walls/ High-standard WR78 big barrel floorchain. Custom paint epoxy primer & two part urethane. Includes fenders, bulkhead, rear bumper, super slide poly floor. 3/8" thick tube construction on reach. 180-degree swivel arm for hydraulic lines. 7 tooth rear chain drive sprocket. 1/2" Super Slide poly floor. Choice of 88C or WR78 floor chain. 7 tooth rear chain drive sprocket. 1/2" Super Slide Poly floor. 180 degree swivel arm for hydraulic lines. 10 gauge steel walls. High-standard WR78 big barrel floorchain. 1', 2', 3' or 4' wall extensions available.